s made sense, until I thought about it. In the first place, the Gospel story of The Life and Ministry of Jesus Christ is not a “traffic accident” – whatever you mean by that. Could a worse analogy be chosen, besides anything else to do with witnessing a murder, war or other crime? Why not use a positive, meaningful analogy, like, “Four witnesses to a birth” – as in the birth of Christianity. Or perhaps, “four witnesses at the Coronation of a King”; or “four witnesses at a wedding”, as Jesus is pictured as a Groom, and the Church as His Bride (Revelation 19:7, 21:9). You can pick any nice event that requires witnesses, and it will be better, rather than to think of the four Gospel writers as witnesses at a “traffic accident”. A second objection to this statement that is made by both Pastors and professors of theological universities, is that while I can see and appreciate the Gospels as four flavors as presented by four different men – each with their own individual personality, heritage, culture, upbringing, education, style and point of view on God, Judaism and Jesus Christ – the fact is that to have four different versions of anything is actually a form of confusion. In order to be able to know what happened, when there is more than one version of any event, you must first synthesize all of the different statements and information into one single and complete account. This is what happens in a court of law, when a judge hears the testimonies of four witnesses to that traffic accident. The judge must have, or construct, as accurately as possible, one version of all of the facts, and all of those facts must be aligned according to a single, consistent chronological timeline. That is the purpose of a court, and the job of the judge – to create from the different testimonies of multiple witnesses, a single version of the events. To do this, the judge first hears each of the testimonies. Where there is agreement among the witnesses, then that is likely what happened. But where there is any disagreement between the testimonies, of even a single, small detail, then the judge must cross-examine the witnesses, and continue to do so until the highest truth presented by the differing testimonies can be ascertained. And this is the case for trying to establish what happened during the Life and Ministry of Jesus Christ, when you have four different “Gospel” accounts of what happened, and the sequences of their events differs. A third objection to the idea of the four Gospels as four “witnesses” is that at least two of the writers of the four Gospels – Mark and Luke – were certainly not witnesses to the Ministry of Jesus Christ, because they had never met or seen Him… but that is another post. So, even the analogy of the Gospels, or their writers, as being “four” witnesses is not true. 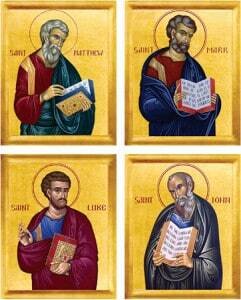 The four Gospels are not really four direct witnesses. And in a court of law, second-hand testimony is inadmissible, and can not even be heard. As it is right now, the only way to know everything that happened during the Life and Ministry of Jesus Christ – all that He said, and did, and taught – is to read each of the four Gospels, whether they were direct witnesses to Jesus Christ, or not. And you do have to read all four of them, because if you missed reading the details mentioned by even one of them, it would not be possible to have a full and complete understanding of everything that happened in the Gospel story. And that story with those details that you missed may be very important in having a full and accurate knowledge of, in this case, the path to Salvation brought by the teaching words and actions of Jesus Christ. So it is logical to have the Gospel Story of The Life of Jesus as a single account that includes all of the details. Where else do you want to hear or read four different versions of the same event? Do you want to read four different sets of instructions, like four slightly different recipies for the same cake; or would you want to read four different versions of a book, like say, MacBeth, or The Client, or Harry Potter? Not likely. What you want is a single, complete, easy-to-understand account of all that happened, and in the correct or most logical chronological order. Why does it make sense to people, as it is told to them by Christian leaders, that there should be four different versions of the Gospels? When reading the four, certain stories and sayings that are mentioned in three or four of the Gospels become well-known, and the other events that are only mentioned in a single Gospel account, are not. Having four versions of the Gospel story causes confusion; so why is confusion when presenting the story of the life and Ministry of Jesus Christ in four Gospels accepted as a good thing (four witnesses!) when four versions of the Book of Acts is not? And consider the daunting task of having to read and understand four slightly different versions of The Book of Revelation. Now, that is a scary thought! And again, the first thing you would want to do is to synthesize all of that information into one consistent timeline – so that you might know more easily and accurately what is about to happen, and when it will occur. In the end, having “four witnesses”, as with having four of anything – especially if they conflict – is confusion. By emphasizing certain sayings and stories because they are repeated, while most of the events are mentioned in only one Gospel, having four accounts can hide the facts of what happened while presenting the information in an unbalanced and uneven way. And it is inefficient to have to read the repetition of the same sayings and stories again and again in four different versions. It seems logical, that if there were ever to be any book that should be very clear about what it says – without any overlap, conflicts or confusion – it would have to be the story of the Life and Ministry of Jesus Christ. How can one fully know the Master, our Shepherd, to follow Him, when His Words are not clear? Jesus said to, “…preach the Gospel…” – that’s “Gospel” – singular, not Gospels, plural, and with confusion. So in conclusion, the world should once again have one single, clear Gospel account of the Life and Ministry of Jesus Christ – a complete story that is built upon the combined testimony of the two who were witnesses, and the two were not witnesses. Because the Gospel story of Jesus should be clear, not as some mystery that must be solved. For more information on the Four Gospels, including who wrote them, and their history as a merged account before they came to be split into four again, see the Four Gospels Resource page. Posted in Four Gospels Info and tagged apostles, Four Gospels, gospel.